Congratulations on coding an awesome interactive project. 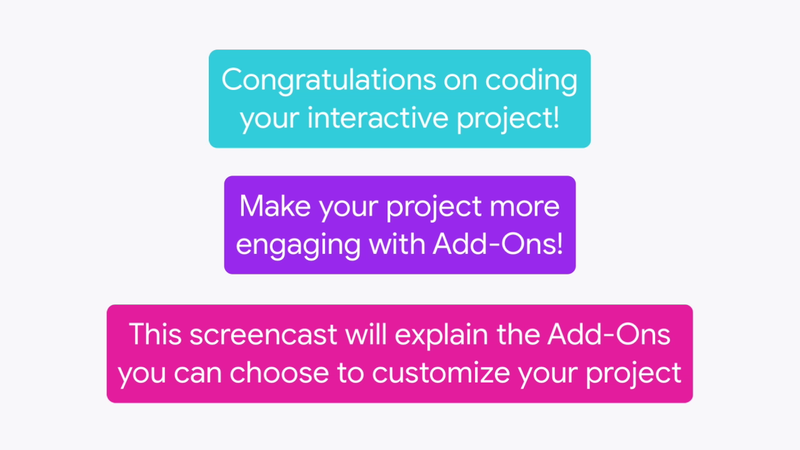 Now, you get the chance to make your project even more engaging for users with Add-Ons. In Spinning Celebration, make the Sprite spin and change color when it is selected. In Shout it Out, make all the Sprites react when one of the Sprites is clicked. If you have a Sprite that you don't want the user to vote for, Shrinking Sprite shows you how to make the Sprite really tiny when the user tries to click on it. Keep the Sprites vote count hidden with Secret Votes. Make a Sprite demand to be picked whenever the mouse pointer touches it with, Pick Me. Remember to use your creativity to customize the design and code of your project. Check out these projects created by other CS First computer scientists, just like you. Explore the Add-Ons that interest you. If you want to continue to create and explore after today's club is over, you can access Scratch and CS First from any computer that can access the internet. Have fun creating and making this project your own.